When the Old Timers meet on June 4 at their annual reunion in Cloudcroft, high in the cool Sacramento Mountains looming above the Tularosa Basin, talk will likely turn to the orchards of cherries, apples and pears that used to line the old road and railroad up to Cloudcroft. Starting the first week in June, visitors to the cool mountains will be able to experience part of that history. Cherry orchards maintained by old families in the area are opening to those who want to pick their own cherries like it used to be. Plump cherries for an instant intense flavor and more cherries to take back home for canning, cooking or freezing—pies, tarts, cakes, jellies and jams—along with the memory of colors, breezes, and hands-on connection to a experience threading people together down through generations. That intense flavor is at optimum nutrition as well. Cherries offer lots of vitamins, anti-oxidants and minerals in a perfect package with the bioflavonoids needed to digest the plump fruits. According to www.ehow.com, because cherries are high in iron, they are good to build up blood. The high iron content benefits organs such as the gall bladder and liver and cherry juice can be a cleanser when 6 oz. is taken every morning. Researchers at Michigan State University have discovered the extraordinary anti-inflammatory capabilities of sour cherries. The researchers found that tart cherries relieve inflammation 10 times better than aspirin. Despite a brutal winter, the cherry tree orchards snuck through a weather window, blossomed and were pollinated. Now they ∆are a week ahead of schedule, said James Cadwallader, and so he is putting out the word along with Bob and Sue Nichols, orchard owners in Cottonwood Canyon on the lower slopes of the Sacramento Mountains east of La Luz. 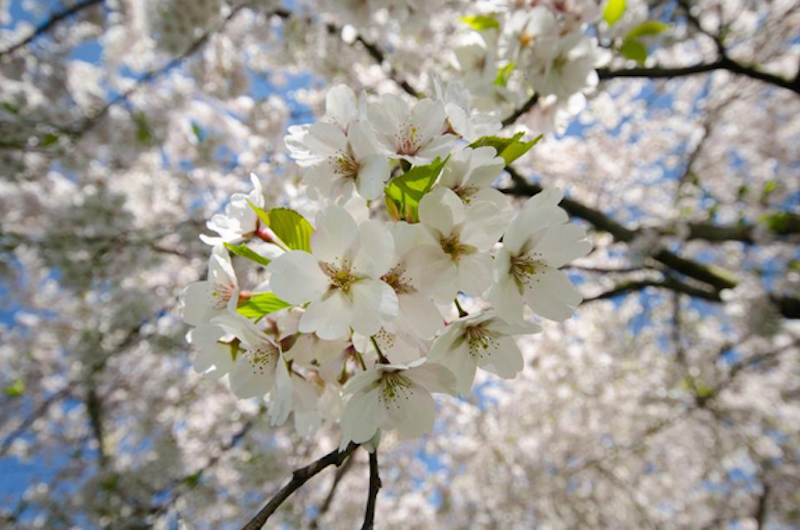 Each cherry tree filled with about 50,000 blossoms in March provide some 12,000 cherries after frosts, wind, pollination complete their season to ripen under the mountain sun. The Cadwalladers have cultivated fruit orchards since they came to the wide rolling valleys above the limestone escarpments falling 3000 feet down to the Tularosa Basin floor while Bob Nichols family cultivated farms high and low over the region, until settling down in Cottonwood Canyon. Neighboring the Nichols, Don Burton also has cherry orchards. The Bing Raniers, yellow blending to red, are perhaps the most beautiful. Our dark semi-sweet Royal Duke are not available in stores anymore, while the bright red plump and somewhat tart Montmorency are the most popular, said James. Mountain grown cherries are huge with more natural sugar and intense flavor from high altitude conditions and intense ultra-violet light from the sun.For avid bird-watchers, cherry picking time might just be dessert after an early morning or late evening forage into these orchards and neighboring areas to catch sight of the many colorful or camouflaged inhabitants that animate the mountain slopes. At Mountain Farms, Jane Cadwallader has been watching for and identifying birds for 55 of her 79 years. Her family “got together and made me retire two years ago,” and she is still busy. “I don’t need a computer or a gym!” she said. Mrs. Cadwallader does an annual bird count for the Audubon Society every year, not including birds she has seen only once or rarely throughout the year or that get blown off course during high winds. There is a huge osprey with its dramatic mask at Wooten about four miles from Mountain Park where there is a small pond. “A lot of birds stay around all year long but the winter birds like three kinds of junco’s and the goldfinches have moved further upslope to nest,” she said adding that the Says Phoebes ¨have been there for about six weeks nesting. “We have at least 70 species of birds. Some are rare like the Canyon Wren and last month, I saw a Northern Goshawk I have never seen before that I got a picture of for identification in my books,” she said. “There can be dark blue Lazuli Buntings, the Yellowbill Cuckoos who like to eat the tent caterpillars, Yellow breasted Chats, crested black Phainopepla who reveal lots of white wing feathers when they fly, flycatchers, numerous hawks, hummingbirds, kestrels, blue and yellow grosbeaks, two types of quail and three of jays,” she said, mentioning only a few of the species that inhabit the area or migrate going north or south or up and down the Sacramento Mountains with the seasons. If contacted beforehand, Mrs. Cadwallader will open the gate before the cherry picking times for bird watchers because “when the crowds come each day, the birds withdraw to quieter territory,” she said. “I took my seven year old grandson early one day. Binoculars are difficult for children to handle and he was able to see lots of birds without binoculars, so it was a good time for him,” she said “We provide everything pickers need except lunch. We have buckets and ladders and advise. Kids as young as two—they love it—along with the older folks. We have been doing this since 1943,” said James, who also maintains the roadside stand in High Rolls for motorists. “My cousin Mark, donated the old railroad station on our family farm at Mountain Park (now in High Rolls), where people coming from El Paso and Alamogordo to get married, according to James Cadwallader. To finish off the day, pickers can stop to study an array of recent maps of several of the agricultural communities that arose from the waters of the Sacramento Mountains. Joe Ben Sanders, a trained archeologist, grew up in the Basin haunts. He has developed a recent passion for mapping the agriculture and family names of the region. Sanders brings together oral history, folk stories, original research and drawings, cartography and a charming penned style to produce a sËeries of new original maps on display at the Tunnel Shop in High Rolls. The Tunnel Shop also features Sanders collection of some 8,000 books, including many historical books out of libraries he purchased and the work of a number of local artisans. For more information and directions to pick you own cherries, check out www.cadwalladermountainfarms.com and www.nicholsranchandorchards.com. This article originally appeared in the June 2011 print edition of the Mountain Monthly.